Ayahuasca has become a buzzword in today’s age. There’s even an entire industry dedicated to going on a trip with indigenous South American shamans known as “ayahuasca tourism.”For those looking for substances beyond marijuana, alcohol, tobacco or even cocaine, ayahuasca may be the right drug for you. One thing to keep in mind, it’s not really a “drug”, but more of a substance designed to heal and teach you about life, past traumas and give you a helping hand as you navigate the future. This isn’t a drug that you can “hit” and feel relaxed, like with marijuana. Every trip is completely different. Rather, ayahuasca is a tool. The main difference with the ayahuasca benefits that differs from other drugs in the intense, powerful healing nature of the drug. Life can be so busy with so many deadlines to meet, projects to finish and dreams to chase. When we simply want to get from Point A to Point B, life has a crazy way of taking us on a spiraling journey that takes us off our intended path. But, with ayahuasca, you'll be able to see through these artificial barriers and actually live in the present moment. When we’re in the [resent, we’re often thinking about the future or the past. The beauty of ayahuasca is that it allows you to connect with the current moment at hand. This is one of the ayahuasca benefits that’s so key. By being present, you’re able to connect your current conscious with deeper levels of your subconscious. There may be some automatic negative thoughts that have developed overtime due to bad experiences. Or, you may have unhealed trauma. Whatevevr it is you’ve expereinced in life and whatever’s tucked away deep inside your mind will be brought to life in the form of visions right here in the present moment. Piggybacking on the grounding, present-moment enhancing effects that ayahuasca has, this healing drug can also bring closure to former traumas in your life. Many buy tickets all the way to places like Ecuador, Brazil and Peru to experience ayahuasca tourism hoping to find healing . But the truth is, healing is not dependent on location. It must be unlocked from within. 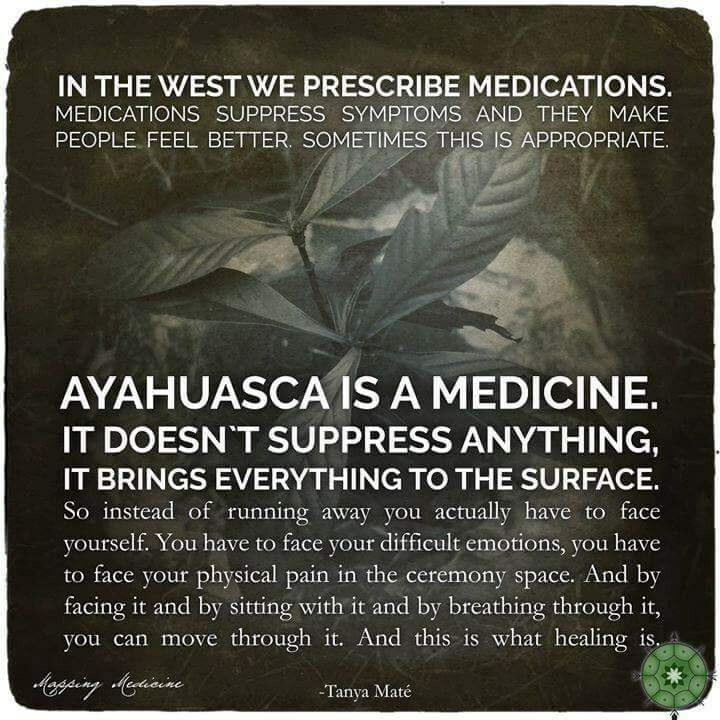 That’s why the ayahuasca benefits can be experienced from anywhere in the world. No matter where you live, you can face your traumas once and for all. Traumas and past experiences shape us into the people we are today. We develop defense mechanisms and avoidance behaviors when we learn that a particular situation is bad. But sometimes these mechanism do not match reality. Ayahuasca benefits many users who face irrational fears or anxieties as it brings closure and understanding into one’s personal psyche. For example, if you were in a car accident when you were younger you may have developed a fear of cars of mistrust of others. Ayahuasca help you unlock those fears and rationalize past events that are unresolved in the subconscious. Sticking with the car accident example, after your ayahuasca trip, you may rationalize within yourself that not all people are bad drivers and sometimes accidents happen because we’re humans. If you have any unhealthy coping mechanisms or negative self talk, trying ayahuasca is worth looking into further. It may allow you to heal in ways pharmaceutical drugs and conventional therapy sessions will never help you. The ayahuasca benefits are endless. One aspect of life we often neglect is our spiritual or religious side. We may stuff our brains full of knowledge, read lots of books and self educate on a daily basis. We may go to the gym, pump up our bodies or hit the treadmill. We may spend time in nature and relax, taking in the sunset. But, oftentimes spiritual and religion are neglected. Ayahuasca benefits its users by connecting them with a deeper purpose and restoring faith and spirituality. This doesn't mean it pushes and spiritual religious ideology, but rather connects the dots for users and allows them to feel connected to humans and the world in a deeper way. Spirituality is an important part of being human and can help you to feel more complete as a person. You can experience all the ayahuasca benefits yourself at home with friends or loved ones to gain a sense of purpose. While therapy and pharmaceutical drugs may help some with depression, it certainly doesn’t help everyone. In fact, there are many pharmaceutical drugs out there that have scarier and more severe side effects than ayahuasca itself. Ayahuasca has been around for thousands of years, used by the natives of South America to seek enlightenment and solve mysteries in their personal lives. The ayahuasca effects are no different than as they are now. You can unlock certain mysteries or experiences that you haven’t come to terms with be going on a healing trip with ayahuasca. If you have depression and aren’t responding to treatment, ayahuasca may be a great natural alternative to try. In addition to the realizations and psychoactive effect that ayahuasca has, the plant itself actually contains a psychoactive substance known as DMT. DMT has recently been studied in 2018 to have profound effects on the human brain, namely allieveienting difficult to treat depression. Stop living life with doubts and without a sense of purpose and invest in unlocking your spirituality and past traumas. Whether you decide to go on an ayahuasca tourism spiritual trip or want to do it yourself at home, you’ll surely have a changed mind and perception of the world. Don’t suffer any longer if you have depression or unresolved psychological issues. Ayahuasca can be the remedy you need to get yourself out of a funk and turn yourself back into a happy, healthy functioning human.